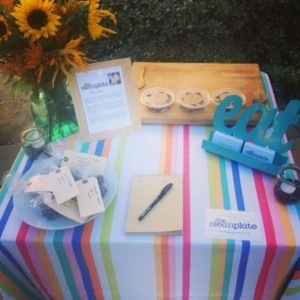 I had the pleasure of sharing some Clean Plate treats with the masses during a private event in Orange County. I made some Chocolate Minty Bites, Chocolate “PB” Bites, Apple Pie Bites, and some Roasted Red Pepper Hummus. It was so fun sharing my recipes with others 🙂 I love how a passion for health is contagious! for refueling after any of your healthy and active endeavors. It is also ideal for satisfying that naughty sweet craving. I LOVE the combination of chocolate and cherries because it always tastes like a decadent dessert. 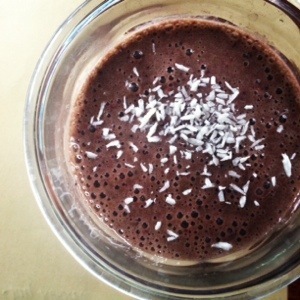 Are you looking for another reason this smoothie is awesome? Well here you go. When it comes to smoothie fruits, I actually prefer cherries over regular berries because I’m not a big fan of little seeds in my teeth. Which is what normally happens in a blackberry/raspberry/strawberry situation. In a way, this smoothie also saves you from public humiliation. Winner. Optional: 1 tsp. glutamine for sugar craving control, gut healing, and muscle recovery. 1. Place all ingredients in your blender. I find that everything blends better when I put the greens in first and the liquid in last. Blend it up! What protein powder you use? Do you look for one that is paleo friendly, or not so much? Thanks! I’ll check out my local Whole Foods and see if I can get lucky!